The presence of PPCPs (Pharmaceuticals and Personal Care Products) in water supplies have been studied by US governmental agencies and also by the World Health Organization, but a considerable amount of research has been conducted as well by the Associated Press. The AP did an extensive 5-month research project on PPCPs in 2008. 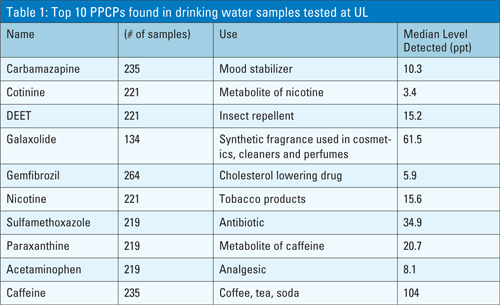 Here are the ten most common PPCPs in US drinking water, according to the AP. Note that results are in tinier amounts than those possible with most conventional testing. Results are reported in ppt (parts per trillion). The Pure Water Gazette’s observation: Of common point of use treatments available to homeowners, activated carbon and reverse osmosis rank in the 90 percent reduction area in all categories. The obvious conclusion is that a high quality carbon drinking water unit is excellent protection against PPCPs, and a reverse osmosis unit (reverse osmosis units normally contain at least two high quality activated carbon filters in addition to the reverse osmosis element) is even better.